White Oak Area of DFWR, a photo by FreeWine on Flickr. Recent rains in the Okmulgee, Oklahoma area have brought the Deep Fork River out of its banks and re-flooded the normally dry 'Thousand Acre Lake'. We went kayaking here after work yesterday. It was a bit breezy, but very fun paddling between the thorn bushes and pecan trees. We saw many large fish. From Highway 75, Take 20th Street, in Okmulgee, West until you reach the first STOP sign at the Okmulgee Coke Plant. Continue to folow that road west, it is now called Sharp Road. Thousand acre lake is a mile or two down Sharp Road. Look for a parking area on the left with signs identifying it as the Deep Fork Wildlife Refuge - White Oak area. Folks are likely to be sitting there fishing. If you reach the Deep Fork River bridge on Sharp Road...you went too far. 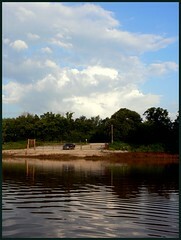 Thousand Acre Lake is not my favorite Okmulgee County kayaking spot, but it is the most rare. It offers that 'flooded forest' vibe that makes Caddo Lake so attractive to me. I am not sure how long the water will remain, but there was plenty of water for paddling and fishing on Thursday evening. 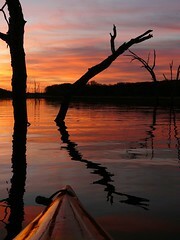 Earth Day Eve Kayaking, a photo by FreeWine on Flickr. A couple Oklahoma rivers are up, but conditions are still very dry here in the Sooner State. However, the Spring waters are flowing well in Arkansas these days. Great Ozark scenic rivers like the Buffalo River and the Ouachita River are flowing well for kayaking trips. Thrilling whitewater favorites like the Cossatot River and the Mulberry River are also runnable these days. The Oklahoma Paddle Sports Association is hosting a Camping / Paddling get together at Lake Thunderbird’s West Hog Creek Campground. As usual, Spring brings a number of great paddling events like the OGAR. The Ozark Greenways Adventure Race will be held on Saturday, May 21, 2011. The Ozark Greenways Adventure Race (OGAR) is a sprint adventure race (8-14 hours) which features running, trekking, mountain biking, orienteering and paddling. The Ozark Mountain Paddlers will be providing safety support for the paddling leg of this event. Learn more about the race at www.greenwayrace.org. What an excellent weekend! We paddled our kayaks on the Deep Fork River both Saturday & Sunday. Dianne set some lines and brought home some very nice-sized catfish. Between runs, we made a quick trip to visit Dave Lindo at OKC Kayak to stock up on kayaking t-shirts and other goodies. OKC Kayaks has an amazingly wide selection of kayaks and kayaking gear. You can test paddle kayaks in countless sizes, styles and brand names. OKC Kayak is quite close to the Oklahoma River, but we didn't bother test paddling any kayaks. Dave had sent me a Facebook message announcing the arrival of the vivid yellow Jackson Kayak Coosa we asked for. The Jackson Kayak Coosa is a sit-on-top kayak designed for river fishing. It is made-in-America by a cool family of paddlers and offers a wealth of unexpected features. We moved fast to grab one! The Coosa provides a real dry ride, loads of storage and moves through the water pretty well for a SOT. We also picked up an extra-long Werner Skagit paddle that really speeds things up. Dianne immediately put the Coosa to the test by landing two very large flathead catfish this weekend. The stand-and-fish stability of the Coosa must be seen to be believed. I was standing in this kayak during my first demo of the boat and I am as clumsy as a hog on ice. The good folks at OKC Kayak also helped me out by installing a new Skwoosh Pro Angler Supreme Kayak Seat in my old Perception Swifty kayak. The seat has a back rest with adjustable side wings, a rod holder and a gel seat pad. My old kayak is now better than new!